I think it’s time to update our blog with a brighter entry, don’t you think, because judging by the last three this space almost reads like a Death Blog. I only write when someone dies. I feel this somewhat defeats the whole purpose of happily communicating with readers. I hope you enjoy my new website, it’s easy to navigate, is pleasing to the eye, and you can load it quickly on your mobile device like the glorious iPhone. Check out some of our new content, my Summer Garden video, and slideshows of my past tours. Perhaps some of you in Australia and New Zealand will spot yourselves! I’m thrilled to continue my longstanding partnership with HarperCollins for the next five novels. One of the things we’ve worked on to accommodate my readers is an enhanced publishing schedule that will ensure a Paullina book once a year. And not just in Australia, New Zealand, and England, but globally, including the United States. I know I’ve written elsewhere about the subject matter for the next book, indicating its lovelorn roots and its Bostonian/Ukrainian setting during the Great Depression and the Stalin purges. And believe me, that’s coming, and not in small doses either. But first, you are going to get a different book for your (I hope) enjoyment. I think it’s so delicious it requires its own (imminent) post. Regarding news of Bronze Horseman film adaptation: I’m not being cagey, but we’re at the cusp of either moving forward or going in a different direction. I’m going to know more in the next few days. I know you’ve all been super (im)patient(! ), please bear with me. No one would love a beautiful epic Tania and Shura film more than me. Signing off for now, more very soon. 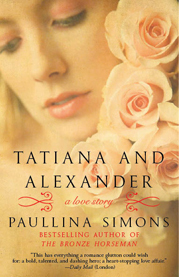 Tatiana And Alexander available in US on June 29! We are very pleased to announce that the second book in The Bronze Horseman Trilogy – Tatiana And Alexander will be available in US bookstores on June 29!!! 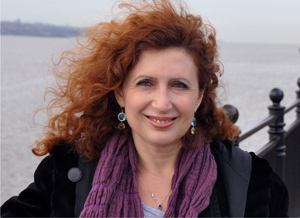 Great news for fans in the United Kingdom and Ireland also with Paullina’s new novel A Song In the Daylight available in the UK and Ireland now!!! And fantastically awesome news for fans world wide, the much anticipated movie adaptation of The Bronze Horseman is now listed on IMDB as being in development! !